Happy New Year From PopFi! Do you want to see fireworks so epic they’ll probably melt your face off through your computer screen? 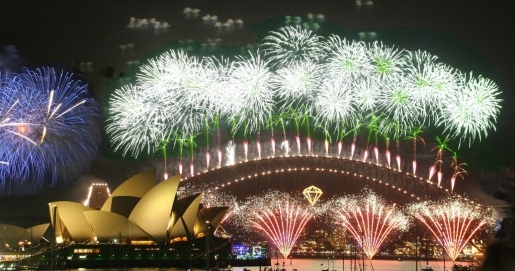 Well, every year on New Year’s Eve, to celebrate the arrival of the new year, the good folks of Sydney Australia gather at the famous Sydney Harbor, in the shadow of the Sydney Opera House, and start blowing things up. This is no ordinary fireworks display, this is quite possibly the best fireworks display you’ll see all year, all thanks to the good people of Australia. There’s really no other way to properly celebrate the new year, honestly. Start the new year off with a bang, end the old year with a bang. The fact that it’s become the gold standard for municipal fireworks displays (with added smoke, lights, music, and lasers) only makes it even cooler that the good folks of Australia are willing to share it with the world. The year that was, 2010, was a pretty momentous one for PopFi. This is quite possibly the best year the site has ever had, and it’s all thanks to you guys. Thanks for reading. Thanks for sharing. Thanks for linking. Thanks for tweeting and retweeting. Thanks for generally sharing the love. It makes it a lot easier to get up and write in the morning when I know it’s appreciated. Cheers, gang. Have a great 2011!